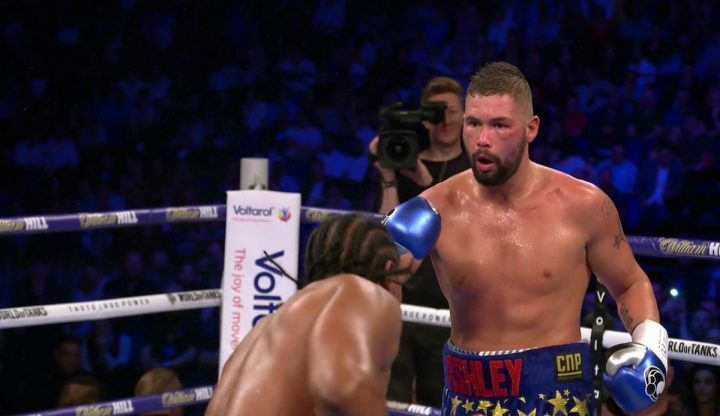 By Tim Royner: Tony Bellew says he wants to fight the winner of next months’ July 21 fight between cruiserweight champions Oleksander Usyk and Murat Gassiev in their World Boxing Super Series finals fight. Bellew (30-2-1, 20 KOs) would like to fight the winner of that fight at the O2 Arena in London, England. It’s possible that they would be willing to face Bellew there, because the chances of the fight going to the cards would be low, especially if he were to face the hard hitting Gassiev. Bellew would likely get hurt badly if he fought Gassiev. That would be a bad match-up for Bellew. Gassiev hits too hard, and he would put Bellew in danger no matter where he hit him. Bellew could have fought Usyk, Gassiev, Yunier Dorticos and Mairis Briedis if he’d chosen to stay at cruiserweight and enter the World Boxing Super Series tournament last year. Instead of doing that, Bellew arguably ducked his mandatory defense against Briedis and chose to face David Haye last year. The WBC then responded to Bellew choosing not to face Briedis by stripping him of his WBC cruiserweight title. The WBC gave Bellew the Emeritus tag, which means he can fight for a world title whenever he wishes. However, that doesn’t necessarily mean the winner of the Usyk vs. Gassiev fight will elect to face him because they’re both planning on moving up to heavyweight immediately after they face each other next month on July 21. Gassiev and Usyk want to face the likes of IBF/WBA/WBO heavyweight champion Anthony Joshua and WBC belt holder Deontay Wilder. Bellew’s promoter Eddie Hearn will likely be able to lure the winner of the Gassiev vs. Usyk fight to face Tony. There’s money to be made for the winner or even the loser of the Gassiev-Usyk fight by electing to fight Bellew on Sky Box Office PPV. It’s easy money for both of them. Bellew is a good fighter, but he’s so far away from the talent level that Usyk and Gassiev have. It’s likely that Bellew would lose to not only Gassiev and Usykm but also Yunier Dorticos and Briedis. WBC/WBO cruiserweight champion Usyk (14-0, 11 KOs) and IBF/WBA champion Gassiev (26-0, 19 Os) will be facing each other in less than a month from now on July 21 at the Olimpiyskiy in Moscow, Russia. Usyk and Gassiev are viewed as the best fighters in the cruiserweight division by most boxing fans. It’s admirable that Bellew says he wants to fight the winner of the Usyk-Gassiev fight, but his chances of success against either of them are next to zero. Bellew will always have a punchers chance to beat the best fighters in the cruiserweight division, but he’s old and not in the same class as either of them. Bellew will be a huge underdog against both fighters. However, his boxing fans would likely point out that people believed that he would come up short against Ilunga Makabu and David Haye, and he was able to beat both of them. The difference is that Makabu was a very flawed fighter to begin with, and nowhere near the same pedigree that 2012 Olympic gold medalist Usyk and the highly talented Gassiev. Bellew caught Haye at the end of his career with him being old, injured and not the same fighter he was in his prime. Haye had been largely inactive since his loss to Wladimir Klitschko in 2011. A prime Haye would have likely sliced through Bellew like butter. It’s quite possible that Bellew is just name dropping Gassiev and Usyk’s names in an attempt to stay relevant the easy way. It’s possible to stay in the boxing public’s mind by fighters calling out champions. Even if the fighters never actually do face the guys they’re calling out, it helps keep them popular in a fashion. Look at Tyson Fury. He’s been able to stay relevant for the last 2 ½ years by name dropping and calling out other heavyweights despite the fact that he’d turned himself into a fat blog. It’s quite possible that Bellew has no real intent in fighting Gasiev or Usyk. He might be just name dropping to keep himself in the public’s mind. Bellew has been calling out Tyson Fury, hoping to get a fight against him. It’ll look bad if Bellew does face the winner of the Usyk vs. Gassiev fight, because he doesn’t deserve that fight. The guys that deserve to fight the winner of that contest are fighters like Briedis and Dorticos. Bellew has fighting at heavyweight against the injured and old Haye. It would be nice to see Bellew earn a fight against the winner of the Usyk-Gassiev fight by facing Briedis or Dorticos. If Bellew could beat one those fighters, then he would deserve a title shot against the winner of the Gassiev vs. Usyk fight. If Bellew just entered the WBSS tournament, he wouldn’t have to call out the winner. He would have been able to compete against them to try and get to the WBSS finals. I don’t think Bellew would have made it past his first fight, but that at least he could say he tried. Dorticos and Briedis would likely upended Bellew right away.